The Air Max 1 caused an aesthetic revolution when it dropped in all of its bright red glory back in 1987, and Nike have continued to push the boundaries of design to places never thought possible for the footwear world. They were dropping mind-bending, alien silhouettes as early as the Air Max 95 – and the recently revealed Air VaporMax has taken things even further into the unknown. 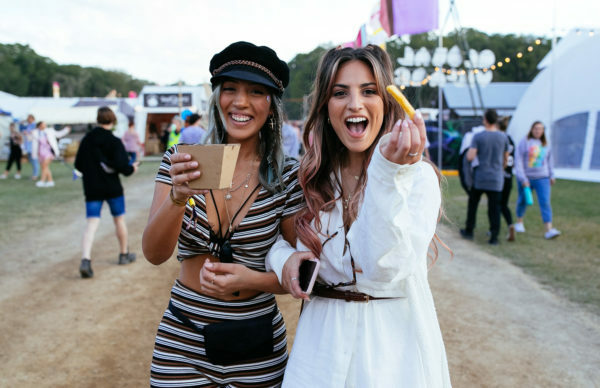 Young Sydney talent Martina Martian delivers playful takes on some iconic Air Max silhouettes – the 97 is a constant feature on her Instagram page, which is littered with tropical colours, pastels and an undeniable feminine twist. Given her favoured colour palette, it’s no surprise that she drew one of our favourites, the Air Max 95 ‘Miami Vice’ in celebration of Air Max Day this year. Martina’s work radiates warmth and endless summer vibes, making us want to rock our favourite Maxies somewhere on an isolated island nation with lots of fresh coconuts. It’s vacation time! 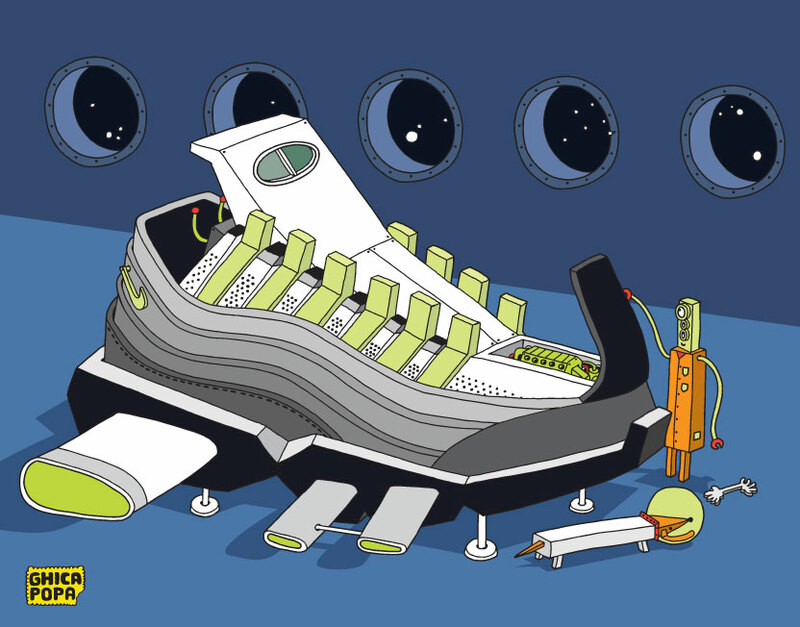 We previously described the Air Max 95 as an alien silhouette, which makes Ghica Popa’s works all the more appropriate. 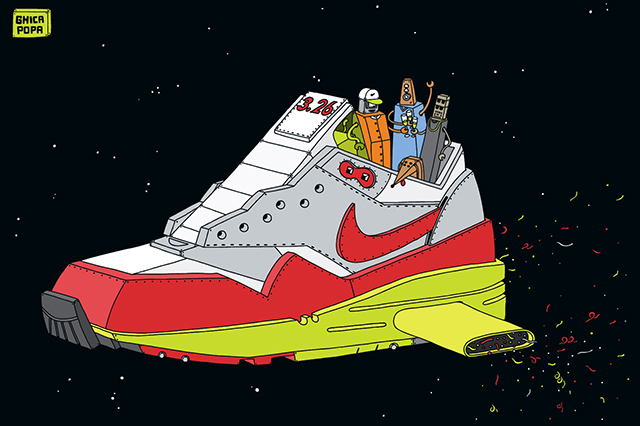 He re-imagines Air Max models as mechanical, futuristic spaceships that cruise the galaxy, complete with extended air bubbles and foreign creatures climbing on board. While the Air Max 95 vehicle is our absolute favourite, the Air Max 1 is also notable – it features 2014’s updated OG rendition with a volt sole, the Air Max Day date stamped on the tongue and an air bubble that looks to be doubling as an exhaust pipe. Give us a ride in one of these anyday. 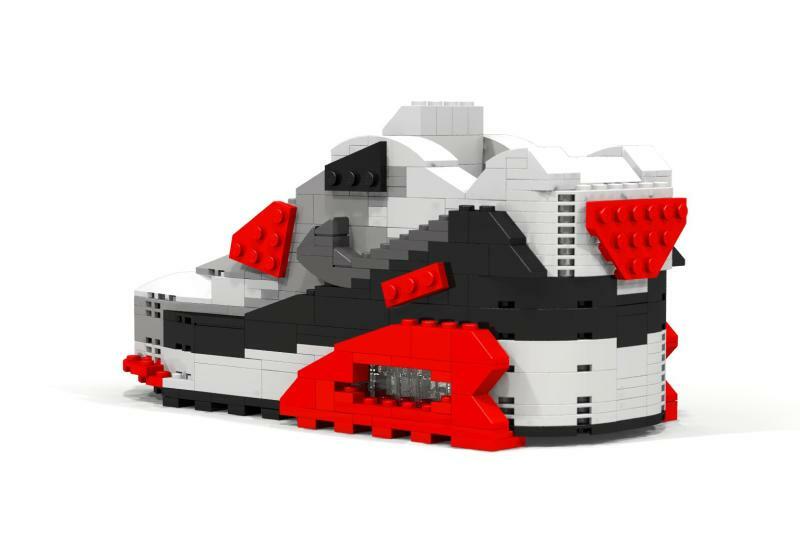 For many of us, a box of Lego is enough to evoke all of those wonderful childhood memories, and Tom Yoo delivers a double serving of nostalgia with his block-based version of the immortal Air Max 90 in Infrared. 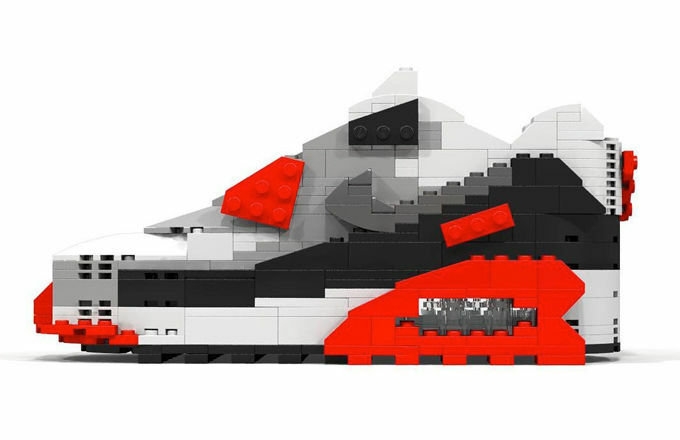 Created in celebration of this year’s Air Max Day, Yoo’s work still has the blogosphere buzzing – it was created with 551 Lego blocks and features all of the Infrared 90s most identifiable features, including that eye-catching heel tab and subdued swoosh. Filfury says that he turned to art as another way to get his sneaker fix after the birth of his first child – and what has resulted are some strokes of pure footwear genius. Here, he twists bits and pieces of Air Max models and turns them into insects that look like robotic overlords of the apocalypse. There’s the underrated Air Max 93 x size? 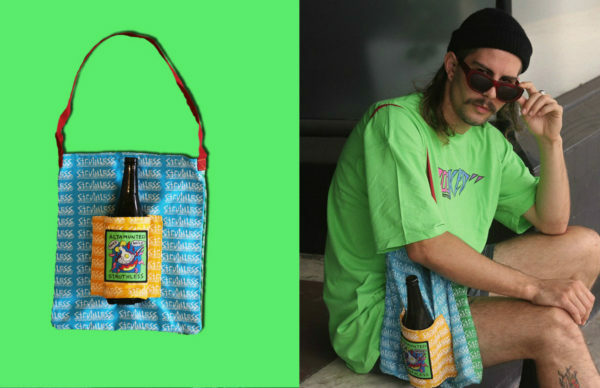 collaboration, which uses the faultless combination of purple and teal suede. Below that is a slightly more fierce creature made from the Air Max 95 jacquard, which provided a flywire-heavy remix of the OG neon colour. 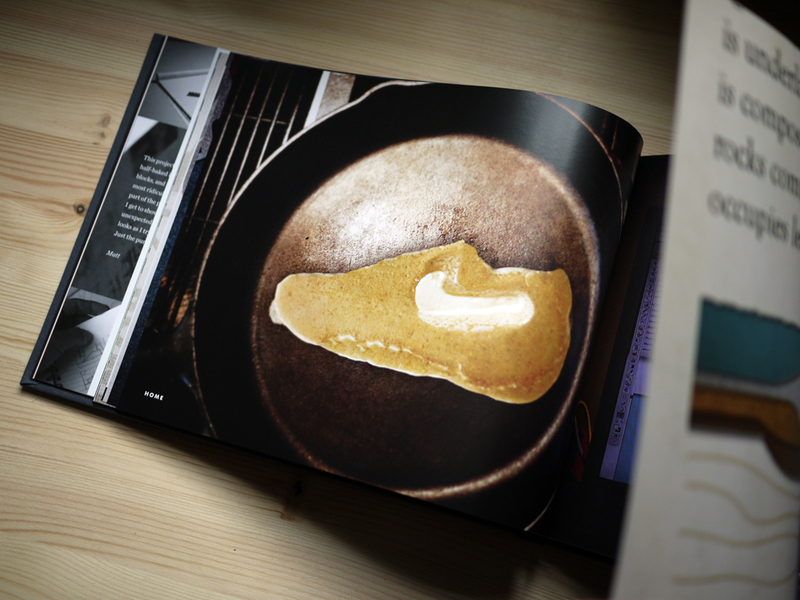 Breakfast is the most important meal of the day, especially when you’re serving up Air Max pancakes. Matt Stevens is the mastermind behind the ‘MAX100’ book, which featured a hundred genius re-imaginations of Air Max silhouettes. It’s a fascinating insight into the Air Max like you’ve never seen it before, with the interpretations above ranging from delicious to the religious. 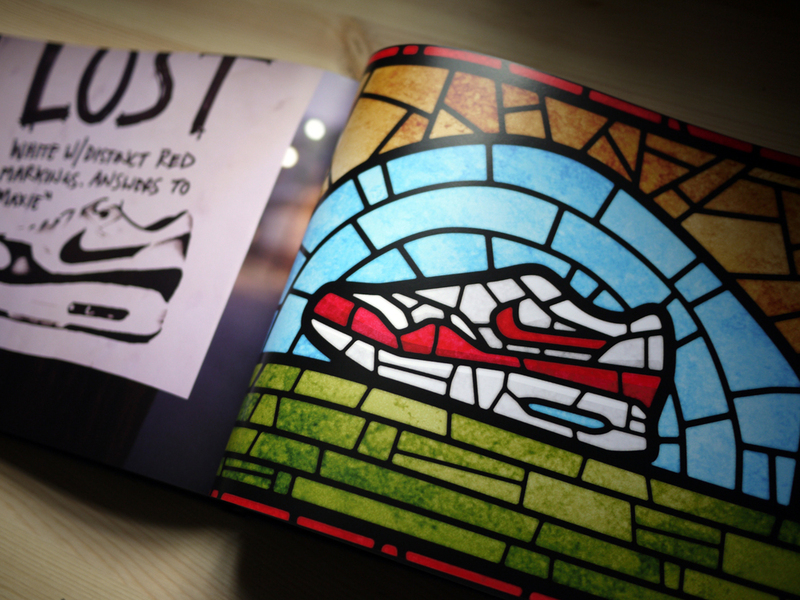 Matt’s love for footwear has also seen him collaborate with Aussie publication and Bible for all things kicks-related, Sneaker Freaker.